I've been playing with new stamps. Or to be more precise, I've been playing with my Teresa Collins Stampmaker and I've been making new stamps. I bought the machine last November - it was going to be a birthday present but I changed my mind before my birthday, thinking I probably wouldn't use it. But then it was on offer and I managed to get 35% off, so I decided I needed it after all. And there it's been, Darnell - languishing in the NBUS department. Before I get to the detail, (and before I forget!) I'm entering this into Darnell's NBUS challenge which is a friendship theme (there's no sentiment on mine, but flowers are a token of friendship) and Time Out Summer Flowers. This fabulous creation by Ruth which was the winning entry in the Craft Stamper Take It Make It potato stamping challenge. Ruth used gingko cookie cutters, I've drawn some flower shapes and made stamps from the images. Ruth's card - isn't it fabulous? 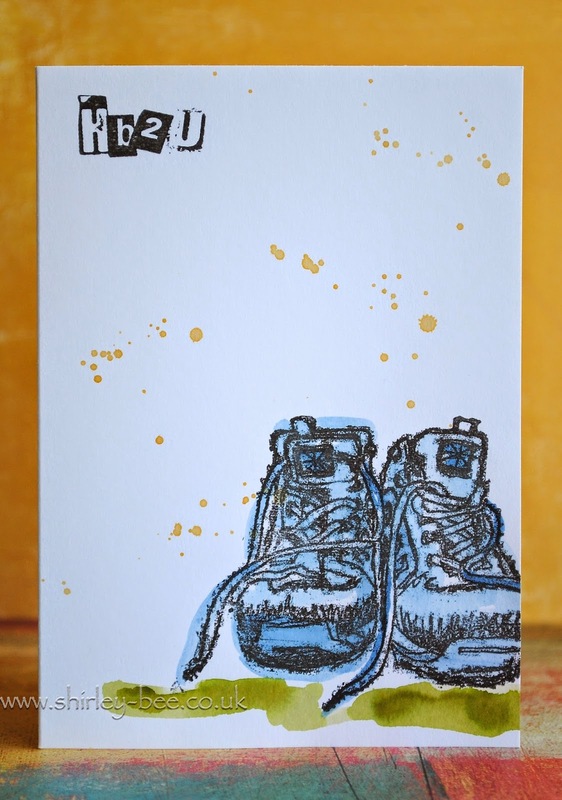 The other thing that prompted me was that I wanted a walking boots stamp for male cards and I couldn't find one. Not one to take the easy route, I decided that I would create my own stamp from a photograph. Got walking boots, got a camera, got a stampmaking machine. Easy, right? Almost. I couldn't fade out the background completely so in the end I printed it out then traced over the photo to get my image. The quality of the stamp isn't brilliant because I printed the negative on the wrong setting, but I actually like the roughness of it, reminds me of a charcoal drawing. The photo on the left is what I traced, and the image on the right is the stamped image rather than the traced image. I'm entering this first one into One Layer Simplicity Challenge where the theme is I've Been Framed and Keep It Simple, where it's Splatters. And I'm entering this second card into Simply Less Is More where it's a One Layer Off The Edge challenge, and Just Add Ink where you've to use three out of the five colours. The HB2U stamp is part of the new release from STAMPlorations. Look out for our birthday blog hop coming soon! 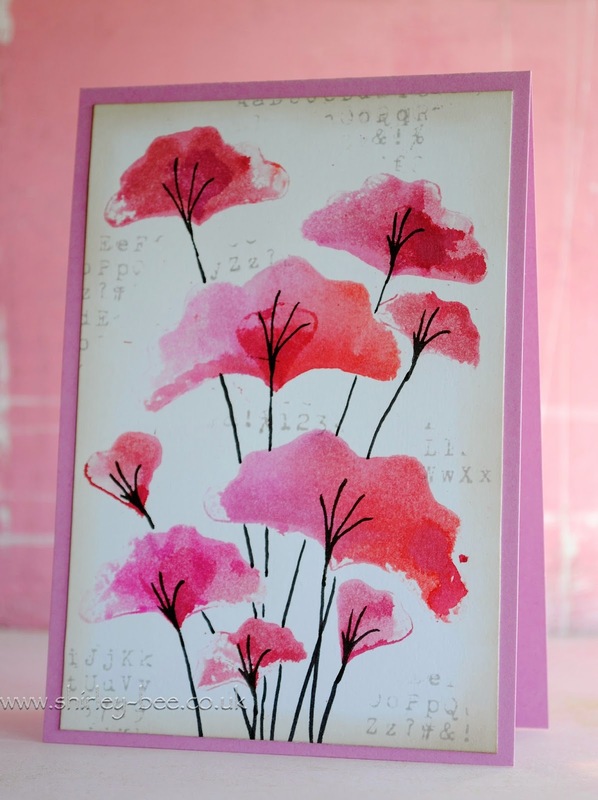 Beautiful card, love the soft shades of colour you have used which such pretty stamps. Lovely version of Ruth's stunning card. Well you learn something everyday,I had no idea there was such a thing as a stamp making machine! I am off to google it now! I think your trainer cards are magic Helen! I didn't know about 'make your own stamps'... how clever! Seriously - you'll be some mayor competition here for some of the stamp companies - are you taking orders? About time you used your stamp maker, LOL! OMG...this is amazing Shirley!!! Speechless! I don't even know what to say, Shirley. I mean, in the end, I always manage to find the words and then some, but it takes me long minutes sometimes of just sitting here, mouth agape. So you are now making your own stamps? And you say things, like "easy, right?" with regard to printing and negatives and tracing and making a stamp ... I mean, holy crap, girl, your talent and creativity are mahoosive!! And, by the way, those cards with the gingko (superb CASE of Ruth's equally superb POTATO card!) and the booties? You should do them on canvas and open a gallery. You should still make cards, mind you, but you are an artist!! Great cards! Awesome how you made them...They say you learn something new everyday....and I sure learned something new here...Great job on making the stamps. Thanks for joining us at Just Add Ink this week, Shirley. That's some pretty impressive stamp-making! I LOVE your cards Shirley... so beautiful! And so clever to make your own stamp from the photo!Thanks for sharing! Two stunning cards - those boots are amazing! Gosh I can't believe you've made your own stamp - how cool! 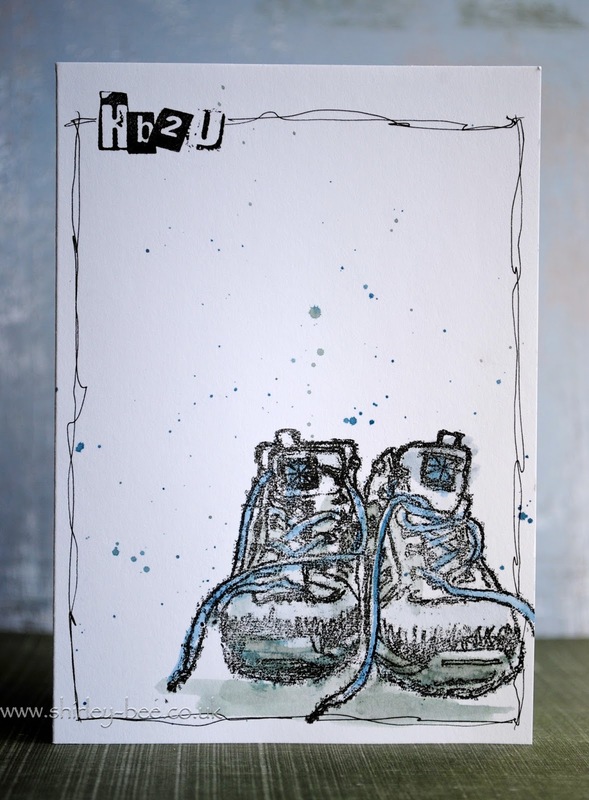 Thanks for entering your 'boot' card into the Just Add Ink challenge this week. A fabulous set of cards and I love those boots ... so appropriate right now too and fantastic OLC and off the edge stamping. Just as I was swooning over the 1st card - I saw your amazing boots and then to top it off, I read your explanation!!!! Is there end to your talents?!!! Fabulous cards hun .... love those boots. You're so clever! Beautiful cards Shirley, the one with the poppies really caught mt eye over at Darnell's challenge; but the fantastic hiking boots remind me of all my holidays spent hiking the mountains of the UK! Wonderful. Seriously? I mean really - SERIOUSLY? You are amazing! Words like "having a go with this machine" and "simply tracing the photo to get my image" have me sitting at my computer, mouth agape, struggling with what to say! The flowers are stunning and the track shoes rock! My advice to you - open a gallery!!! Shirley what a totally amazing stamp you have made! I had a different make of machines some years back but sad to say it ended up in the bin, certainly never produced results like this! HI, surfing over from Darnell's challenge. I actually have that Teresa Collins machine too, and I've never used it. I'm scared of it. It seems really complicated. But these lovely flower stamps you made encourage me. Your flower card for Darnell's challenge really pops off the page. When looking at all the small images on the screen the flowers go "pop" and that is a good thing. The boots are so charming.